European style quality from Hansa. 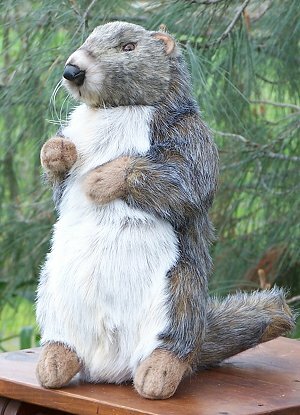 Lovingly designed from portraits of real marmots. 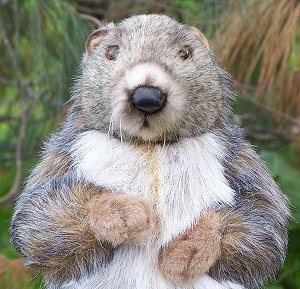 Marmot - Any of 14 species of giant ground squirrels found primarily in North America and Eurasia. These rodents are large and heavy, weighing 6 to 15 pounds depending upon the species. Marmots are well suited for life in cold environments and have small fur-covered ears, short, stocky legs, and strong claws for digging. Length of the bulky body is 12 to 24 inches. Marmots are found north of Mexico and in Eurasia from the European Alps through north-central Asia, the Himalayas, and northeastern Siberia to the Kamchatka Peninsula. The closest living relatives of marmots are ground squirrels and prairie dogs.